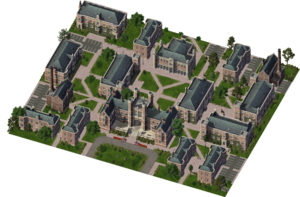 The University is a Civic Building that provides Education to your Sims. The buildings surrounding the Quad on the lot are probably based on those surrounding Brookings Quadrangle on the Danforth Campus of Washington University: Busch Hall, Brookings Hall, Cupples I Hall and Ridgley Hall. Schools are designed to greatly increase the Education Quotient of your Sims, however it only has an effect on a small age group. With Universities, the average household age must be between 50 and 70 Years old to have any real benefit. The University also carries an educaiton bonus for Households with an average age of 20. In College and University Rankings, it is only above the City College. Having a University in your city is a requirement for unlocking the Advanced Research Center and, by extension, the Space Port. The News Ticker fluff entry created on its placement is "New #city# University To Make Empty Heads Full". This page was last modified on 6 May 2014, at 10:24.